We have two gardens at the Dolphins. The babies have a private garden where they are able to play on the ground without being in danger of fast moving children. 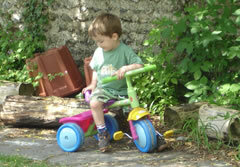 The older children have a garden which has more room and larger climbing equipment. 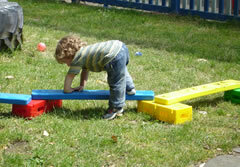 The children are given lots of opportunity to enjoy being outside. 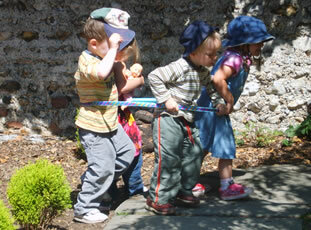 The garden is a very valuable resource in the children's learning space as well as a place to relax or let off steam. Most children really enjoy playing outside and we use this time to ensure the children make good progress in their physical development through careful activity planning. This helps children to develop the confidence to enjoy moving with control, using their bodies in various ways, for example dancing to music, acting out and miming stories or meeting the challenge of an obstacle course. They can study bugs, plants, the weather, noises, smells, growing, sand, water, art and textures. The children can choose whether to be peaceful or noisy, play alone or with a group, working together making plans for games, continue with activities they were doing inside. Things like acting out the storyline of a book such as 'We're going on a Bear Hunt', or playing circle games, riding on the bicycles and scooters, rolling things down the slides and then following themselves. All the children are encouraged to play outside several times a day, come rain or shine as we have a special large sheltered area. We ask that you provide them with suitable clothing, which may be left on your childs peg. In summer we insist on having sun hats and lotion to protect your child from the UVA rays.